Maurice Sendak wrote and/or illustrated about 100 books in his 65 year career. After Sendak's death last week I gathered all the Sendak I have and I've got about 30 or so of his books. They favor the more obscure ones, though I do have a copy of Where The Wild Things Are as well. Surprisingly, there is no good comprehensive bibliography of Sendak's works that I could find on the web. There is good bibliographic list on his Wikipedia page. but there are only links to a few of the more famous books. To my knowledge Sendak never sanctioned a website of his work. The Rosenbach Library, which is the official repository of his works, does have many small treats on their website but not a big comprehensive, visual bibliography. In time, I hope. 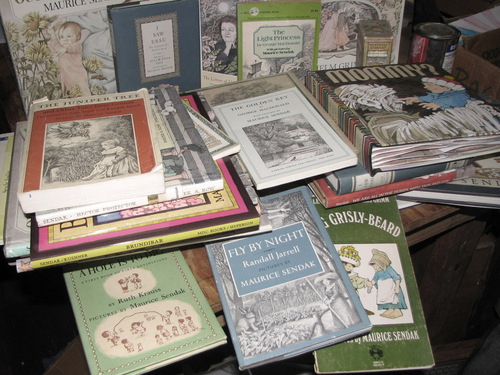 My Vintage Book Collection in blog Form's Tribute to Maurice Sendak - Note the links on the page to scans of some of the more obscure individual books like I'll be You and You Be Me and Hector Protector.